Now that I have made marmalade, I am constantly thinking of recipes to include it. I really don't want to find any jars stuffed at the back of a cupboard two years down the line. I have been working in the bakery at work for the past couple of weeks. We are busy with new customers so the orders are coming in fast and furiously and it is all hands on deck. At present though, we just don't have enough hands so we are all flat out all day trying to get enough baked and packed to fill the pallets quickly enough. It is always good to be back doing the hands on work but the collapsed discs in my back are screaming out by the end of every day and it is all I can do to swallow some food, painkillers and collapse. It is almost unheardof for me, but twice this week I haven't even had the energy to turn my computer on at home! I spend my days thinking of healthy sensible recipes that I can make at home which will sustain me during each working day and ensure that I finish the day feeling healthy rather than drained. However, having made marmalade this week, everything I make this week is going to contain this rich bitter jam and so will not rank too highly on the health scales! This bar is (yet!) 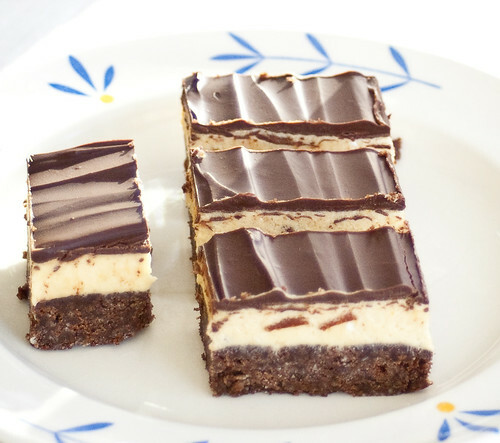 another variation on Nanaimo bars, but the filling is a blend of bittersweet marmalade and custardy cream. With a crushed chocolate biscuit base and a chocolate topping, it is also a more substantial take on jaffa cakes. I have changed the recipe a bit, to lower the sugar content and take out the raw egg in the base. I am really looking forward to the bitter note of the marmalade cutting through the sweetness of the custardy layer and the chocolate on top. A little piece mid-afternoon should give me just enough ooomph to get me through till the end of the day & see me home with a smile, I hope, and that will definitely make me more popular in my house! Mix flax and water & leave to stand for 5 minutes. Add 1/2 tsp vanilla extract then stir it all into the butter. Stir the butter mix in to the crumb then pour into the prepared tin. They look very good. I am having the same predicament with my marmalade. I keep meaning to make marmalade cake, but the girls convince me to make chocolate instead. This looks like a happy compromise. Looks gorgeous and delicious! I love it. I hope you back gets well soon. Please take care.